Any experienced poker player will be able to tell you the importance of position in any hand, especially so in the game of Texas Hold em. Acting last and being able to see how your opponents play before deciding on your action can give you a tremendous advantage over the other players in the hand. However, there is another important factor that can increase or decrease the value of your actual position at the table. This factor is known as relative position. "Relative position" is your position in relation to the pre-flop raiser. There is often going to be a pre-flop raiser in the game of Texas Holdem, and your position at the table in relation to this raiser can be good or bad depending on where you are sat and how many players are left to act after you. In a nutshell, it is better to be to the immediate right of the preflop raiser than it is to be to the immediate left, even if your actual position at the table is better if you are sat to the left of the preflop raiser. Fact: Relative position can sometimes play such an important factor in a hand, that your actual position can be rendered worthless even if you are on the button and are last to act. Why is relative position important? When a player makes a bet on the flop, it resets the cycle of actions between the players involved in the hand. For example, lets say that we are on the button and there are two players acting before us. We will call them "Player A" and "Player B". Flop actions when in "normal position" example 1. Flop actions when in "normal position" example 2. Either way, we are last to act and get to see all the other players' actions before closing the action on the round. In these "normal position" situations, our position is beneficial (as it should be). Flop actions when in "relative position". 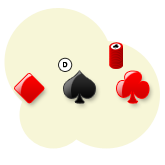 Thanks to Player B's bet, Player A is forced to act again, which means that we no longer get to close the action in the hand. This will happen from time to time, but it's not always a big deal because we still get to see all the other players act before we decide what we are going to do. Relative position and continuation bets. As already mentioned, there is usually going to be a preflop raiser in any given hand in Texas Holdem. Similarly, it is common to see this preflop raiser make a continuation bet on the flop if they are first to act or if the other players have checked to them. Note: The principle of relative position relies on the important fact that a preflop raiser will usually make a continuation bet on the flop. Now because it is commonplace for a preflop raiser to make a continuation bet, the other players in the hand will expect this and frequently check to the preflop raiser if they are first to act, to give the preflop raiser the opportunity to make the first move. The player who checked to the raiser and could have any range of hands. Example of relative position and continuation bets. We are on the button with Q J . A player in the CO makes a standard 3BB raise. We decide to cal because our cards are decent and we have position. The small blind calls and the big blind folds, so 3 players go the flop. The flop comes Q 7 6 , giving us top pair with a good kicker. The small blind checks to the preflop raiser, who then makes a solid ¾ pot size bet. Now the problem here is that any play we make will not be closing off the action, as the player in the small blind now has the opportunity to act again. We have been sandwiched between the player in the CO who has made a continuation bet with a potentially strong hand, and between another player who could have a stronger hand than ours as their check did not necessarily indicate strength or weakness. Their check neither shows strength nor weakness because they are confident that the preflop raiser will make a continuation bet as standard, and so they may well be checking with the intention of calling/raising when the action gets back to them. Small Bind: <- could just as easily fold, call or raise the CO's continuation bet. 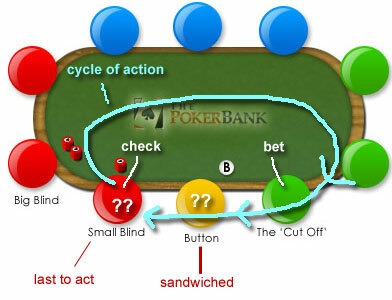 A scruffy diagram that highlights the relative position problem on the flop after the player in the CO makes a cbet. A call in this situation would not be bad, but we are leaving ourselves open to losing chips to the player in the small blind if they decide to raise. Furthermore, if the small blind decides to call as well, we will go to the turn ready to be put in the same tricky situation as we were on the flop. As you can see we are now in a pot that could potentially lose us a significant number of chips because we have a decent holding, but we're in a highly compromising position that we probably didn't expect when we first entered the hand. Hopefully the above example has helped to highlight how your position relative to the preflop raiser can have a big impact on your actual position at the table. The best relative position to have is to be to the immediate right of the preflop raiser. This is because your action will close off the betting on that particular round if the raiser does indeed make an expected continuation bet. The worst relative position to have is to be the the immediate left of the preflop raiser. This is because you will be the first to act if the preflop raiser makes a continuation bet. The player(s) now acting after you that initially checked to the preflop raiser could have any hand ranging from total air to a monster. You should always try and evaluate your relative position in any hand along with your actual position, as it will have a bigger impact than you may think. You probably never realised it before and will likely forget about it before it's too late the next few times it happens, but try your best to be aware of it. It will sink in after a while.